You may remember that two weeks ago I donated 13 inches of hair to Locks of Love. As soon as our daughter saw my hair, the begging began. Our daughter is 7 1/2 years old and asked to have her hair cut and donated as well. Daddy was having a difficult time saying yes to her request. 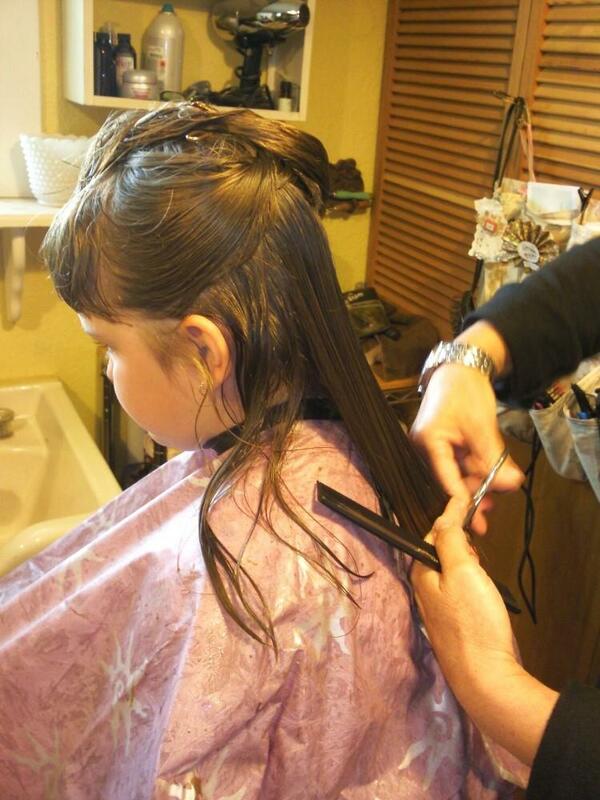 She had NEVER had a haircut before, only trims to get rid of split ends and shorten her bangs. I love her long hair but I've always thought she would look adorable with a short cut. If it were only up to me, she would have had a short haircut, probably a bob, a long time ago! We have to take baby steps when it comes to daddy, long hair and his baby girl! 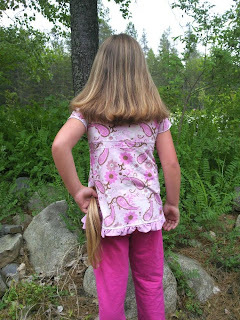 After a couple nights of talking to my husband he agreed that she could have her hair cut. His only stipulation was that it not be cut above her shoulders. I was happy with that and so was she. 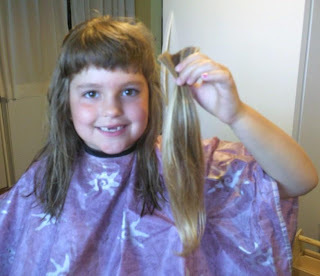 When I asked her why she wanted to cut and donate her hair she said... "Mommy, I want to help those kids who don't have any hair. I don't think it would feel good to have no hair because they probably feel weird and people might make fun of them. They can have my hair because I have enough for all of us." Then she went on to say... "Besides, I can always grow more hair and they can't. I want to help them and give them my hair so that they can have long pretty hair just like me. I just have one question... how do they get the hair to stay on their heads? Do they sew it on or something?" I am so proud of my daughter for making the decision to give a piece of herself and make such a caring and thoughtful donation. 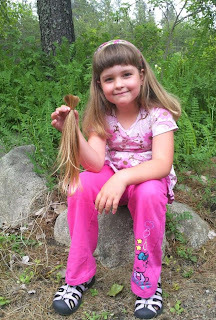 Have you (or your children) ever donated your hair to Locks of Love? Locks of Love is a public non-profit organization that provides hairpieces to financially disadvantaged children under age 21 suffering from long-term medical hair loss from any diagnosis. They meet a unique need for children by using donated hair to create the highest quality hair prosthetics. 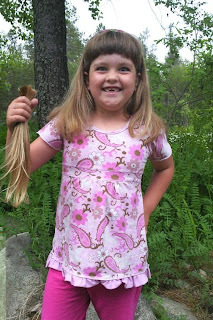 Most of the children helped by Locks of Love have lost their hair due to a medical condition called alopecia areata, which has no known cause or cure. The prostheses we provide help to restore their self-esteem and their confidence, enabling them to face the world and their peers. I wanted to donate my hair when my dad was going through cancer treatments, but it was highlighted, so I found a nonprofit called "Little Princess Trust" in England that does accept colored hair to make wigs and donates them to little girls. You should be so proud of your daughter, what a beautiful heart she has!